Remember back in January when I wrote a blog post about our plan to date? You don't remember? Oh well, I forgive you. Basically, Dan and I wrote out a list of fun things we could do together and we wanted to try and do one thing off the list each week. Which we did really well with for two months and then kind of fell off the bandwagon. Well we decided to pick it up again! We've done a few dates off the list such as candlelit dinner, playing pool, etc. and this past week we were supposed to go a museum together. But Dan surprised me with a different date instead! Last Wednesday I came home to find my basement transformed. Dan planned a night of indoor camping. Since the weather outside isn't our ideal camping weather, we opted to stay in. Plus, this kind of camping has its perks. Real pillows and indoor plumbing to name a few. 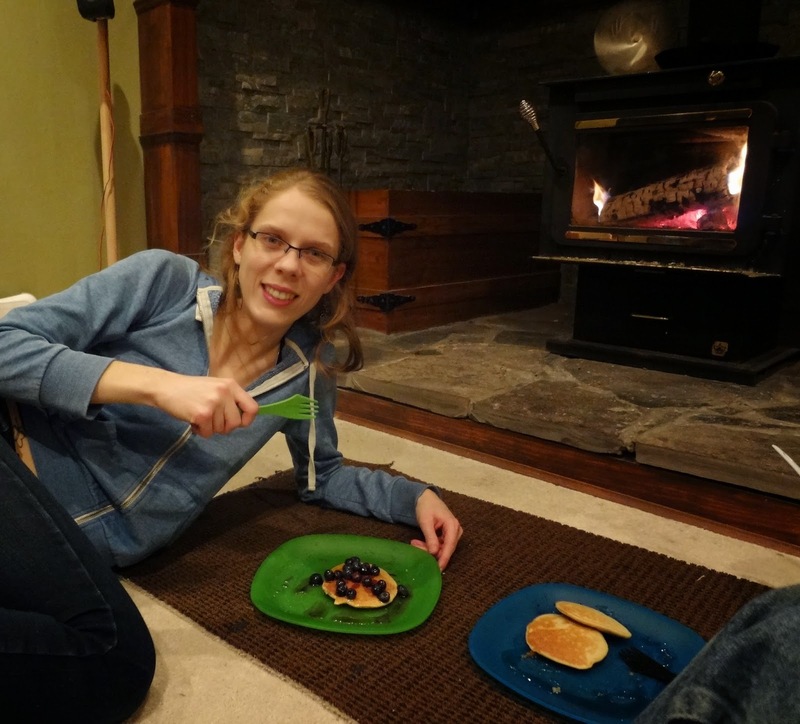 We made pancakes on the wood stove and ate by the fire. It was pretty fun. Especially since it was cozy warm, unlike our last camping trip. We even got to test out our new camping cutlery. Dan even thought of playing a "gurgling brook" soundtrack in the background, so we could imagine ourselves out in the woods somewhere. It was a great touch. After our pancake dinner by the fire, we played Yahtzee and Boggle. Dan sure does love me, since he's not a big fan of either of those games. We then got distracted by old yearbooks and flipped through those for a while before moving on to guitar playing and knitting. We finally decided to turn in, after grabbing our real pillows from our bed of course, and slept quite soundly by the fire. We did turn off the background noise though, since we both prefer silence when sleeping. It was the perfect date and Dan was super sweet to surprise me with it. Needless to say, the museum trip got bumped to another week. Anyone else ever camped out inside? It was a first for me. You two have such fun together! I envy you! How delightful! Looks like you guys had fun. :) And thank you for posting the boggle board, I immediately started searching for words! Miser and ozone were my best ones that I found.